There’s nothing quite like a fresh, warm waffle. There’s nothing like cooking them the old fashioned way, either, but that isn’t as enjoyable. Most people only enjoy fresh waffles when they’re staying at a hotel or visiting a restaurant for breakfast. The giant machines these venues use for waffle making would take up far too much space in any kitchen to be practical. Fortunately, there is a variety of waffle makers you can use at home. Many of them even store vertically to save space. The American waffle doesn’t taste much like its European ancestors anymore. Even Americans’ Belgian waffles are unlike the kind of sweet treat delivered by street vendors in the actual country of Belgium. So, really, it’s fitting that Americans are pursuing the art of making mastering their own versions of the waffle. Waffles in America are breakfast food, not street food, for one thing. They don’t have the brioche-like crunch of European waffles, either. American waffles are different, but they’re just as tasty and there’s an art to making them well. Waffle makers allow anyone with a kitchen to master that art quickly. They also cut down on mess, something everyone who has ever cooked will appreciate. Shopping for these appliances isn’t easy. The only way to know if you’ve found a good waffle maker is to try the waffles it makes. We’ve done the legwork for you to gather the most popular waffle makers on the market into a single article. We’ve included a variety of styles with features bound to suit any waffle lover. If you like a simple way to make well-cooked, fluffy waffles, this tricky little appliance may belong in your kitchen. This product is designed to make a single, perfect waffle. The titular flipping action allows you to turn the waffle part way through baking so it can be fully cooked on both sides. The nonstick grid makes clean up quick. All you have to do is wipe the gridded cooking plates down after you enjoy your waffle. The lid locks to prevent spills, and a drip tray catches any overflow. A browning control feature lets you cook your waffles your way. Whether you like them perfectly soft and light or a little crunchy at the edges, you can use the same machine. This feature is great for families, especially families with little picky eaters. Indicator lights let you know when the machine is powered and when it’s time to add the batter. These features are not only convenient, but they are also great safety measures. This is a mid price waffle maker. It isn’t something most buyers will want to replace often, but it should last long enough to validate the investment. One of the best parts of this machine is its size. In age of small apartment kitchens, space is at a premium, and there’s only so much space you can sacrifice in the name of waffles. This set up is smaller than it looks and very practical. It also seems to do its job very well. It uses a lot of metal, especially in areas near the heat source, so it’s unlikely to develop fatal flaws, such as melted hinges or a warped lid lock. A perfect waffle maker for busy families, this appliance gives you twice as many waffles in a short amount of time. This devices uses gravity to provide a perfect, even cook for your waffles. Extra deep cooking grids give the final product great texture and deep pockets to catch syrup and other yummy toppings. The heat resistant handle locks the dual waffle irons into place, and a drip tray catches any excess. Differently colored indicator lights alert you when the waffle maker is plugged in and when the iron is ready to cook. You can only wipe the machine clean, so it’s especially important to use non-stick spray before you add the batter. Two is better than one, and that’s double true when breakfast foods are involved. This is another mid price waffle maker. Like most of the best waffle makers, it flips to cook the waffles so one side isn’t more done than the other. This increases its value. Based on appearances, it may feature a fair amount of plastic, but there haven’t been a lot of reports about melting features. Plastic isn’t a problem so long as it isn’t near the hot parts of the appliance. The biggest flaw is the stickiness of the non-stick plates. So long as users oil the plates before cooking, however, this isn’t a serious problem. It’s a safe investment for the average family, especially since it makes twice as many waffles. Simple, small, and easily the stored, this compact machine is great for the casual waffle-lover with a small kitchen. Rather than cutting costs by using plastic housing, this waffle maker includes stainless steel housing to prevent against literal meltdowns. A temperature control dial allows you to determine the texture and color of your waffles. When your waffle maker is on, an indicator light will remind you that it’s using electricity. A second light lets you know when the waffle irons are hot. Although most products claim to have non-stick cooking plates, this product takes things a step further by making the cool-touch handles non-stick. This makes cleanup a breeze, even if you have a bit of an accident adding the batter. This waffle maker essentially comes from a bargain brand. It’s very affordable, especially considering the stainless steel in its construction. Buyers should keep in mind that they will trade value for price, however. Although it only happened a few times, some users have had trouble with the heating element. Waffles turn out half-cooked. If this happens, you should be able to return your appliance as faulty. It’s critical to get it out and test it immediately after purchase. The manufacturer instructs users to apply oil to their waffle maker before each and every use, which is a sign that the interior of the machine uses substandard non-stick technology. Still, a family could spend more money at a fast food restaurant than this waffle maker costs. Since it can be stored vertically, it gains value for buyers with limited storage capacity. A sturdy, big, mid priced waffle maker, this product is perfect for buyers looking for a reliable machine that doesn’t take as much storage space as a flip waffle maker. This machine is designed to create excellent waffles without cutting corners. The lid is heavy to prevent the waffle from rising too high and developing an odd texture. Twin indicator lights let users know when the machine is on and ready for waffle making. Rather than using an unmarked, imprecise browning dial, this machine uses five specific settings so buyers can always get exactly what they want. The round, nonstick cooking plate is divided into four sections so the big waffle is easy to divide between diners. It’s also perfectly suited to a single, hungry diner, of course. When you’re finished, simply wipe the plates clean and store the machine on its side. Best of all, this machine comes with a limited three-year warranty so you can use it with confidence. This mid price waffle maker is designed for storage as much as it’s designed for making waffles. The fact that it cannot flip the waffles means you’re bound to get a few unevenly cooked batches. If it routinely cooks waffles uneasily, it’s time for a return. That’s the value of the three year warranty. Without the warranty, this product would be a bit of a gamble. As convenient as it is, a waffle maker that fails to do the one thing it was made for is not worth the price. This product still isn’t the best value for its price, but some users may prefer it to its larger competitors for practical reasons. This waffle maker combines the advantages of flip style waffle maker with the space saving benefits of vertical storage. The thick, non-stick irons inside the waffle maker are designed to produce classic Belgian waffles. The interior is brushed steel that’s designed to last. Rather than depending on the user to watch a light or guess at how long a waffle will take to cook, this product offers a digital display. It’s easy to see exactly how long you have until breakfast is ready, and it’s a much more accurate way to cook. Of course, the big advantage of this product is its unique swivel base. The area with the waffle iron can flip to either side of the base. 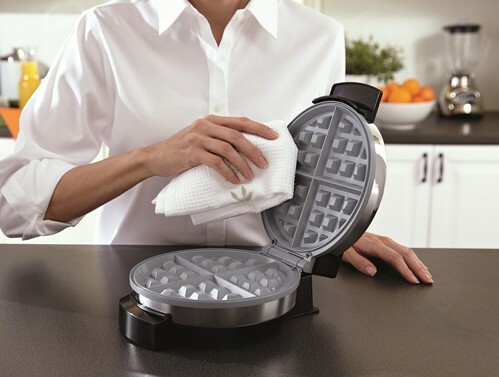 It’s a trick bigger waffle makers use, but usually it involves a clunky stand that makes storage a pain. This waffle maker’s base locks in place when it’s not in use so you can store it vertically. It really is the best of both worlds. This is a mid priced appliance comparable to the first two large waffle makers we examined in this list. Unlike those two appliances, this one stores in a very small space. Unlike the other space saving appliances, however, it flips. It’s easy to see the flip as a gimmick, but time and time again, the flip style waffle makers out-perform their static competition. Gravity is a great baking aid, apparently. Think of it like flipping pancakes. The only problems with this product are fairly minor and can be solved with a little creativity and vigilance. It’s one of the best investments on our list. This friendly appliance is an entertaining way to train the little chefs in your household or please the young at heart. This novelty waffle maker brings the joy of magic of Disney into your kitchen. Rather than a grid of squares, each waffle shows a happily smiling Mickey Mouse. It’s perfect for kids and adults alike. Even the indicator light features the trademark Disney mouse’s outline. Non-skid rubber feet keep the appliance in place when you open and close the lid. Non-stick cooking plates help you make beautiful waffles every time. This product also comes with a one year warranty. It’s mid price and appears to perform adequately well considering the price. Apart from a few faulty products, this item seems to perform well. It’s especially popular with parents of young children, of course, but it does make genuinely tasty waffles that everyone will enjoy. Still, buyers should keep in mind that novelty products use a lot of their resources on the design rather than materials of a product. You shouldn’t expect this machine to last forever. It’s recommended for families, but dedicated waffle enthusiasts would probably do better with a higher end product. This high-end appliance is for the most serious Belgian waffle lovers. However you like your waffles, you can make them perfectly with this machine. It has seven different browning settings for everything from the lightest, fluffiest waffles imaginable to dark, crunchy treats. A steam-release system ensures the inside remains fluffy no matter how crunchy you choose to make the exterior. LED indicators let you know when the appliance is heated and when your waffles are ready. Non-stick waffle irons with deep pockets make superior breakfasts that are easy to clean up. A removable drip tray helps expedite cleanup even more. It can even be stored vertically. This product is the most expensive on our list. It costs several times what our mid price options are worth. That said, the cost is balanced by the quality of the waffles created. If you want a machine that will make great waffles every time, this is the machine for you. It’s built to last, and the variety of settings ensures that you, your family, and your guests can always get the perfect Belgian waffle. The cost will prevent a lot of shoppers from choosing this item, but it is a long term investment. The perfect waffle maker for parties and large families, this appliance can make a meal or a snack for an individual or a group. Whether you want a large waffle that resembles a flower or you’re trying to prepare breakfast for the troop, this waffle maker is your solution. It makes traditional waffles that are crispy on the outside and fluffy on the outside. Five different browning settings allow you to determine exactly how crispy those waffles will be. A light indicator lets you know when the waffles are ready. The lid locks for easy cooking and secure storage. Thanks to the non-stick interior, cleanup is easy, too. This product is slightly more expensive than most of our options, but it still sits at the top of the mid price market. Although this shape of waffle is very common in parts of Europe, it’s still a bit of a novelty in America. That means this is a novelty appliance. A lot of the investment has clearly gone into the plate design. While it works great for a while, it will give up the ghost sooner than it really should.It ought to last longer for the price. Unless you only need the appliance to work for a single event, you’re better off with one of the other items on our list. A compact flip style waffle maker, this product is designed to make a great waffle in short order. This flip style waffle maker cooks waffles perfectly with its brown setting gauge. With the twist of a knob, you can get exactly what you want. The machine includes power and ready indicator lights, non-stick cooking plates, and a removable drip tray. One of the best parts of this product is the free recipe book that comes with the waffle maker. It includes everything from classic waffles, to cornmeal waffles, to savory waffles – including pepperoni pizza waffles! This waffle maker sits towards the middle of the mid price range. It isn’t the cheapest on our list by far, but it’s still relatively affordable. It’s fairly normal for users to judge the cook time of their waffles based on the steam leaving the appliance rather than the indicator light, especially when using mid range products. So, the fact that the light is somewhat inaccurate doesn’t really hurt the overall value. Unfortunately, while most of these products work perfectly well once they’re plugged in, a few seem to have problems with their electrical system and never heat up, no matter how long they’re left to warm. These defects are immediately apparent, however, and the product can be returned. Over all, it’s a good product for the price. The only product on our list with removable cooking plates, this waffle maker offers great waffles and easy cleanup. Although the cooking plates are not machine washable, they are much easier to wipe down once you remove them from the machine. Warm, soapy water and a rinse will leave them looking like new. This product’s unique design also makes it one of the best space-saving flip style waffle makers on our list. Power and ready indicator lights make the process easier, and a two year manufacturer’s warranty keeps your wallet safe. Even though this isn’t a costly machine, and it has worked well for a number of people, it isn’t the best investment. It’s a sad fact that one of this appliance’s best selling points is also its greatest weakness. Quite a few users found that after a handful of uses, the lever that holds the cooking plates in place no longer performed its function. No matter how hard they tried, users couldn’t get the plates back in position. This problem seems to be widespread, which suggests that all the levers are weaker than they should be. Even if the waffle maker survives the first few uses, the plates could fall out at any time. Although this is hardly an exhaustive list of every waffle maker on the market, these items represent the top brands and styles available to consumers. We’ve provided snapshot summaries for easy browsing along with pros and cons lists. If you’re interested, you can check out our detailed list and description of each waffle maker’s features. In the end, it all boils down to value. We weigh the price against the true worth of each appliance at the end of every review. If you want to know how we judged these machines, check out the full Criteria for Evaluation section after the product reviews. Below that, you’ll find some FAQs you might want to consider before making a purchase. Every waffle maker follows the same basic design principles, but manufacturing, materials, and additional features make a huge difference in how well a product performs. In order to judge between this varied products, we used a set of criteria for every evaluation. Some products perform better when they’re made from light materials like plastic. Unfortunately, waffle makers aren’t among those items. Because of the extreme heat waffle makers use to quickly cook and crisp batter, they work best when they’re made from predominantly heat-proof materials. Steel, particularly stainless steel, is a favorite for obvious reasons. A good way to estimate how much steel is in a product is to evaluate the weight and size. If two products of similar size have vastly different weights, the heavier one features more steel and sturdy metals. The lighter product, even if it advertises steel components, includes a lot of hidden plastic. Since waffle makers get so hot, cheap materials can actually become a fire hazard. There are plenty of stories about kitchen appliances literally melting hinges, locks, and lids. If the wrong item happens to be sitting next to your appliance, like a discarded paper towel, you could have a kitchen fire on your hands. Because of this, quality of materials and construction is one of the most important considerations when we evaluate waffle makers. Waffle makers are all about an easy, tasty meal. Poorly designed appliances, however, can make a huge mess. Since many of the waffle makers on our list are flip style waffle makers, the risk of a tremendous mess is high. After all, if the latch comes loose when you turn over your waffle, you’ll be in for a nasty surprise. That surprise could seriously burn you as well. To determine ease of use, we examined helpful features like grips, locks, and bases. If the handle gets too hot, it’s difficult and dangerous to free your finished waffle. Even if the handle is made from heat-proof materials, you could still get burned if the grip is situated too close to the hot parts of the waffle maker. Locks, as we mentioned, keep your food intact and your skin free of burns. Waffles are delicious, but they aren’t worth a trip to the emergency room. Rubber feet or a heavy base ensure the appliance doesn’t move when you open or close the lid and doesn’t scoot away when you flip your waffle. Last but not least, ease of use requires indicators to remind users about the temperature of their waffle maker. Essentially all of these conveniences are paired with safety, which is a serious concern when you’re dealing with an appliance that puts out so much heat. How well does the waffle maker make waffles? Ultimately, a waffle maker is judged on the food it creates. The biggest sin a waffle maker can be accused of is uneven cooking. No one wants a half-baked waffle. Features like steaming, which aid crust development without over-baking the center, improve core performance ratings. Like toast, waffles come in many shades, and different buyers prefer their waffles to be different shades of brown. Some may be barely cooked and fluffy while others crunch when you stick a fork in them. The best way to cook different waffles to suit different tastes is to use a temperature and/or time control. These are usually called browning settings. The more settings, the better. Numbered dials are also better than blank browning spectrums. It’s hard to get the dial back to the exact place you had it before if there are no marks. Most people don’t have time to clean much after breakfast, so maintenance concerns are a big deal for waffle makers. Unfortunately, extremely few waffle makers have removable cooking plates. The only one on our list that sported this feature did not design the removal system well, which annulled the feature’s value. Still, if a product received a lot of notes concerning sticky plates that are supposed to be non-stick and other concerns, they impact its maintenance score. Since even most nonstick appliances encourage the use of oil in some capacity, we didn’t count light oiling before cooking against the machines. If products got sticky despite the oil, however, they received some critiques. Also, while deep pockets in the waffle iron make for luscious Belgian waffles, if they are too narrow, they make cleaning a chore. The best waffle makers should be easy to wipe clean, and that goes for both the interior and exterior. One product featured non-stick handles, and that definitely improved its maintenance score. There are many different types of syrup you can use to spice up your waffles! Instead of using the same old maple syrup, you can try various kinds of syrups that provide a more delicious, creative, and interesting taste for your breakfast. This kind of syrup comes straight from a very flavorful drink that will fill your kitchen with a warm aroma. The main ingredients found in this syrup are cinnamon, star anise, and a pinch of black pepper. This variation of maple syrup is great to use on waffles as well as a roasted chicken. To make this delicious syrup yourself, you will need one cup of pure maple syrup, three pieces of star anise, one cinnamon stick, and half a teaspoon of black peppercorns. First, you will need to mix all of your ingredients together in a small saucepan over medium heat. Bring your mixture to a simmer and allow to cook for approximately five minutes. Take the pan away from the heat and allow the spices to soak for approximately ten minutes. Lastly, you will need to strain the spices. Now you are ready to enjoy this new syrup warm or at room temperature! This syrup is a sweet and spicy mixture that instills sliced ginger as well as a pinch of cayenne. The spicy ginger maple syrup is perfect for waffles, pancakes and as a glaze for your salmon dinner! To make this delicious variation of maple syrup, you will need one cup of pure maple syrup, a one inch peeled and sliced piece of fresh ginger, and approximately a ¼ teaspoon of cayenne pepper. First, you will need to add all of your ingredients into a small saucepan over medium heat. Bring your mixture to a simmer and cook for approximately five minutes. Take the pan away from the heat and allow your spices to soak for approximately ten minutes. Lastly, you will need to strain the ginger. Now your spicy ginger maple syrup is ready to enjoy at room temperature or warm! This is kind of syrup is simple to make and unites the best tastes of pumpkin pie into a syrup wonderful for pancakes and waffles alike! To make this syrup you will need one cup of light corn syrup, one cup of water, ½ cup of brown sugar, ½ cup of butter, 1/3 cup of pumpkin puree, one teaspoon of ground ginger, one teaspoon of ground nutmeg, one teaspoon of ground allspice, and a teaspoon of ground cinnamon. First, you will need to add your water, corn syrup, and butter into a pot and bring to a boil. Next, you will need to whisk all of your spices, the pumpkin puree, cinnamon, allspice, ginger, and nutmeg into your corn syrup mixture. Allow to cook for approximately five to ten minutes, until all of the flavors combine making sure that you are stirring frequently. This syrup is best served hot. This syrup is a perfect topping for your waffles and pancakes as well as over vanilla ice cream! It consists of apples that are simmered with cinnamon and sugar. You can also adjust the amount of sugar and cinnamon to your personal preference. To make this delicious syrup, you will need two tart apples that are cored, peeled, and sliced, ½ cup of sugar, one tablespoon of ground cinnamon, and two tablespoons of water. Mix your apples, cinnamon, sugar, and water into a saucepan. Next, you will need to stir your mixture until the sugar is dissolved and bring it to a boil. Decrease the heat to low, and allow to simmer for approximately ten minutes, or until the apples are soft and the syrup has thickened. An easy and delightful coconut syrup that your entire family will love! Perfect with mango or banana waffles or pancakes that will bring a tropical taste to your breakfast. To make this coconut syrup, you will need one 14oz can of coconut milk, one cup of flaked coconut, and ¾ cup of brown sugar. Mix your flaked coconut, brown sugar, and coconut cream in a saucepan and bring to a boil. Once your mixture is boiling, reduce the heat and bring your mixture to a simmer. Allow it to cook for approximately twenty minutes, making sure to occasionally stir. Lastly, place your mixture into a blender and puree it until it is smooth. Cinnamon syrup is a deliciously sweet topping that is perfect for pancakes and waffles, as well as apple slices or strawberries. To make this syrup you will need a ½ cup of white sugar, ½ cup of brown sugar, 2 tablespoons of all-purpose flour, ½ teaspoon of ground cinnamon, one teaspoon of vanilla extract, and one cup of water. First, you will need to combine your brown sugar, white sugar, cinnamon, and flour into a small saucepan. Next, combine the water and vanilla extract into your mixture. Stirring often, bring your concoction to a boil. Continue to boil and stir your mixture until it thickens. Take the saucepan away from the heat and allow to cool before serving. This syrup is made using blueberries, orange juice, lemon juice, and lemon zest. It is perfect for waffles as well as pancakes. To make this syrup you will need two cups of frozen wild blueberries, a ½ cup of orange juice, two tablespoons of fresh lemon juice, one teaspoon of lemon zest, ¼ teaspoon ground cinnamon, ¼ cup of water, four teaspoons of cornstarch, and two tablespoons of dark brown sugar. In a saucepan over medium heat, bring the blueberries, lemon juice, and orange juice to a boil. Then stir in the cinnamon and lemon zest. Next, lower the heat setting and whisk in the cornstarch and water until the mixture contains no lumps. Stir the mixture and add brown sugar until it has thickened. Lastly, allow the mixture to cool before using. Can I use my waffle maker to make other kinds of foods? Yes and no. A recent fad has a lot of people turning to their waffle makers with all kinds of interesting, non-waffle foods in mind. One of the most popular trends is to use the waffle maker to cook perfectly crunch hash browns. You are free to use your waffle maker however you’d like. Be sure, however, that you do not put too much inside the machine. This could put additional stress on the hinge and lock. Over time, that pressure will lead to permanent damage. That said, one of the official recipe books included with a product we reviewed features things like pepperoni pizza you can make in your waffle iron. The joy of cooking at home is the freedom to experiment. Keep in mind that things like sugar and cheese are much stickier than waffle batter, though, so you may need to apply extra oil. You’ll probably have to spend significantly more time cleaning up afterwards as well. How long should I expect my waffle maker to work? This is a question of price vs. value. We go into this question at the end of each article, but if you’re asking this question, then we should probably explain our reasoning further. Every purchase is an investment, but it’s also a gamble. We can’t safely promise how long a waffle maker will continue to work. This is the advantage of manufacturer warranties. With a few notable exceptions, the more a machine costs, the longer it will last. The quality of materials involved is also a reasonably good indication of lifespan. Plastic will not last. Steel will. Novelty items are cute, but they don’t last long, either. The more you spend on a waffle maker, the longer it should last. Like we said, though, there are exceptions, so be sure to read our Price/Value summary at the end of each product review before making a final purchase. Is it safe to add things into my waffle mix? This depends on two things. First of all, examine the type of hinge on your waffle maker. A regular hinge will have trouble handling much beside liquids. Better hinges allow the top to effectively settle flat on top of the lower cooking plate. This design is better for waffles, and it gives you more room to experiment. Second, be careful about what you put in, and be prepared for some errors with your trials. Chunks of fruit may be too moist and prevent the batter around them from setting. Melted chocolate may stick to the non-stick plates. If allowed to burn, chocolate could potentially ruin the non-stick coating. Nontraditional waffle batters also include stickier ingredients that you will probably have to counter with extra oil or a very specific cooking time and temperature. That’s no reason not to try, though. Simply use caution and begin experimenting with recipes someone else has already tried in their own waffle maker. Is a waffle maker worth the investment? How often do you make waffles? Your lifestyle will determine how much use you get out of a waffle maker, so consider your habits realistically when you’re looking at potential purchase. Do you have time for a nice breakfast at least once a week? Do you really like waffles enough to eat them at least once or twice a month? Can you cook enough waffles to satisfy your entire family, or will the process take too long? Not everyone eats waffles for breakfast. Maybe you’re looking to improve your family’s weekly breakfast for dinner menu. If you’re one of the ambitious souls wondering what kinds of things you can safely cook in a waffle maker, then you have a higher chance of getting your money’s worth. However, you have to understand that experimentation comes with risk, so don’t buy an expensive machine for your first waffle maker if you plan to get creative. Make your mistakes with something cheap and protect your money until you’re ready for a more expensive option. When you’re ready, the pricier options will still be there. You may have even gained the experience needed to tell the best waffle makers from the duds. Until then, we’re happy to help you pick.